Turkey has suspended talks with Gaz de France over a pipeline project that would bring Caspian natural gas to Europe in reaction to a French bill on the mass killings of Armenians during Ottoman rule, senior Turkish energy officials told Reuters on Thursday. Nabucco is a 4.6-billion euro ($6.14 billion) project to transport natural gas from Turkey to Austria, passing through Bulgaria, Romania and Hungary. The planned pipeline would reduce Europe's dependency on Russian gas. France angered Ankara last year when its national assembly passed a bill making it a crime to deny that the moass killings of Armenians during the fall of the Ottoman Empire amounted to genocide. "We will suspend partnership by Gaz de France until the French presidential elections. We will decide according to policies to be followed after the elections," a senior energy ministry official who declined to be named said. The four other countries involved in the project, Bulgaria, Romania and Hungary, have already approved partnership with Gaz de France in the project, which will transmit Caspian and Iranian gas to Western Europe, bypassing Russia. 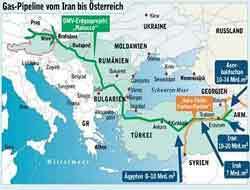 Austrian oil and gas group OMV heads the consortium planning to build the pipeline. Bulgargaz, Transgaz from Romania, MOL of Hungary and Turkey's Bota? are also partners in the project. The consortium has been seeking a sixth partner for a while. Gaz de France had no immediate comment and French foreign ministry spokesman Jean-Baptiste Mattei said in a statement the ministry had not yet received any confirmation. Finalizing a deal to start building the pipeline has already run into trouble after negotiations with France's Total for a stake collapsed earlier this year. A senior OMV executive said last month a final investment decision had been further delayed well into 2008 as negotiations to win a sixth investor dragged on. The project has also been criticized for taking too long to plan with no reliable timetable existing for gas suppliers. It faces a series of hurdles, including financing, possible steel bottlenecks and pending EU permits for the pipeline. If construction of the 3,300 km (2,050 mile) pipeline starts in 2008, it could begin operating in 2011. It could transport annually 25.5 to 31 billion cubic meters of Caspian gas to Europe by 2020. Turkey, seeking EU membership, strongly denies claims by Armenia and its supporters that the Ottoman Empire committed a systematic genocide against about 1.5 million Armenians during World War I.
Ankara says that figure is greatly exaggerated. It says large numbers of both Christian Armenians and Muslim Turks died because of inter-ethnic fighting, famine and disease. The Turkish armed forces froze bilateral ties with its NATO ally France due to the National Assembly bill. The bill still has to be approved by the Senate to become law.